View Poll Results: Square-soft or Square-enix? who agrees with me that ff 1-6 were amazing games!? My god ff1-2s is were it ALL started! ff4's story was soo good and ff5's class customization and ff3's unique weapon leveling system! FF6's EVERYTHING! haha I love them all soo much! Wish squaresoft never changed to square-enix i feel they have been more focused on graphics and visual effects then game play these days. IDK i could be wrong and it could be just the nostalgic feeling i get when playing them but square soft just seemed to know what WE want ff7-10 also amazing games!! ffX is close to my favourite FF. I feel graphics do nothing for me if the story is lacking and the game play is sub-par. I wont peoples opinions on this square soft or square enix and tell me your reasons why you prefer them? Last edited by Azaratow; 05-16-2012 at 08:06 AM. I liked 6 the best out of the old ones. 7s my all time favorite. Don't really like the ones after x so far. I have always felt that the creativity had taken a drastic decline since the name was changed to Square Enix. Sure, the graphics might be better, but I think that's all it has going for it. I didn't mind FFXII or FFXIII, and the best character of all time was created in FFXIII, but she still reminds me of a female Squall. 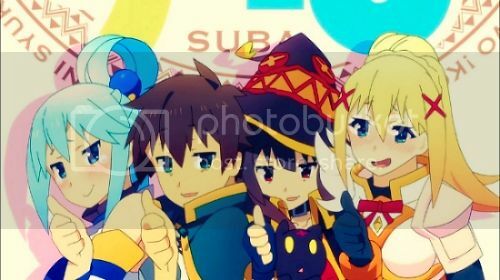 It could also be why I like her so much. It's also hard to tell the future of Square Enix since said name change. They have a lot of things planned, but I'm not seeing many results. I prefer Squaresoft games due to their creativity. I loved the stories they made. FFVIII is still and always will be my favourite. I could just be biased and not seeing past my own opinion, but Square Enix really hasn't impressed me with their recent games. I'm kinda in between, SquareEnix's responsible for what is in my opinion by far the best game in the series while SquareSoft has indeed bigger number of solid to great titles. Ah, yes. So manly with their 80's hair, blue lipstick, and beads all over the place. 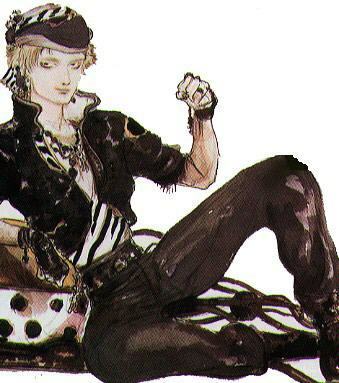 I like Amano's works, but he's designed his fair share of "pretty boys" too. It's just the graphical limitations couldn't show much of it back in the day. As for the topic, I dunno. I've enjoyed a lot of Squaresoft games, but I can also say that SE has done some pretty good stuff too, imo. Squaresoft might get the vote just for the sake of nostalgia though. Squaresoft had loads of talented people directing which equated to awesome games. Square-Enix's talent pool shrunk but they have still put out games I have utterly enjoyed. I don't like the time it takes SE to release some of their games. 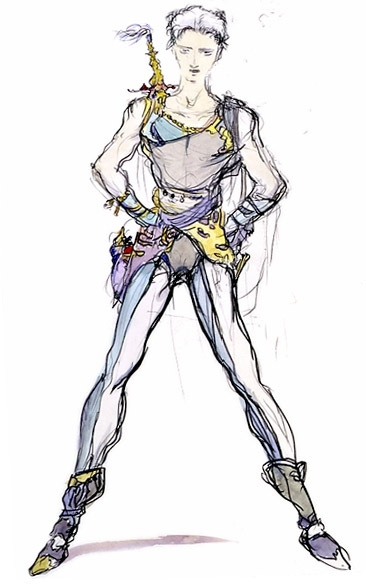 Amano's style is more androgynous than those that came after him. What of Kuja? And Why was Cloud cross dressing? And Sephiroth has the longest hair of any FF char I've ever seen. Doesn't make them bad characters, but their men were still roughly the same. You had your manly men, then your ambiguous ones. Every Final Fantasy I have played had everything I wanted to see in an FF. At first FFXII, I hated it with a passion...played it again...fell in love with the game. Each game must be different, if they just wanted to make another FFVII they would just re release the game. I like everything they make. Except that X-2 game, it only had cool jobs. lol at everyone picking on pete. 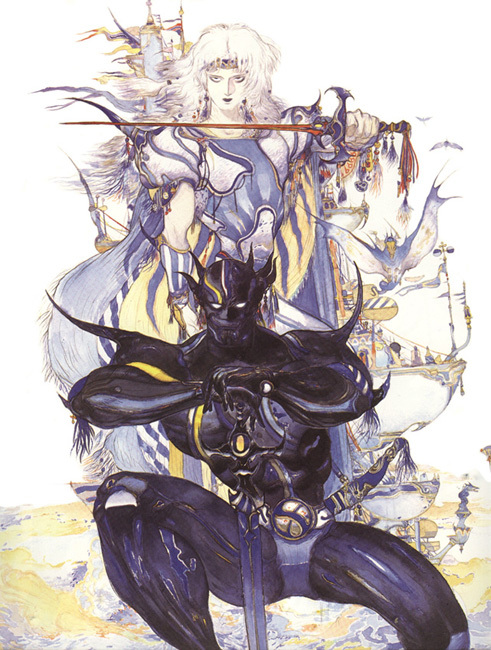 In his defence, Amano's designs never reflected in-game characters appearance. I consider sephiroth to be manly, in an.. oedipus kind of way... and barret, whao now thats manly man. squaresoft actually put effort into their games because their success relied on it. Now that they have merged with enix and have the funds and manpower to produce mutiple titles at once with no real fear of bankrupcy because of devoted fans, they just try to appeal to the masses. Example: Kingdom hearts. Chuck a bunch of everyones favorite characters into one game and then MILK the franchise. FF7 deserves to be milked, because its its own game. There is a reason why it's called "CONCEPT" art. Like really? You are mad because the first idea was changed in the end? Every game does this. EVERY GAME. Do you even know what Concept means? Without looking it up right now? Also FFVI is it's own game. As well as FFI, FFI, FFIII, FFIV, FFIV The After Years, FFV, FFVIII, Crisis Core, Dirge of Cerberus, Before Crisis, FFVIII, FFIX, FFX, FFX-2, FFIX (which is like 5 games in one) FFXII, FFXIII, FFXIII-2, FFT, FFT-A...you see where I'm going. Every game is it's own game. It's not like you are seeing Bioware making FFVII? Dude no offense... But you sound kinda like you aren't getting the picture here, we are talking about the corporation who make the game. Why are you going on about concept art? that's relevant to like 15% of the game? "Every game is its own game"? sure, Zelda is a game and Tomb Raider is also a game.. and they are both their own game but they were made by different teams. People play games and judge the game as well as their corporation/brand/team, to see if they have made a good quality game or not. People trust in Blizzard to make amazing games because they are ****ing awesome and have made good games in the past.. People trust in square-soft because they are also ****ing awesome and like blizzard they are reliable but when soft- sold out to enix- the trust from players went down because in "my opinion" so did the quality of games SURE each game is its own BUT! if it's made by an unreliable team you loose trust in it because it's a judgement of corporation not just game. hence the vote for whether square-soft is better then square-enix! lol sorry i may have misunderstood your post but i felt you were sorta calling us dumb i quote("Do you even know what Concept means? Without looking it up right now?") and playing devils advocate just for the sake of it. look.. even after saying all this i am definitely no hater of enix- They aren't "BAD" they have made games i love! But i am comparing them to square-soft and when you compare the two in my opinion soft- just has the upper hand, i feel they were just a team better at putting together a plot as well as a highly enjoyable game play system. Last edited by Azaratow; 05-17-2012 at 04:52 AM. Squaresoft. We didn't used to be disappointed when a new final fantasy came out back then. The same can't be said about square enix.